By buying this product you can collect up to 2347 bonuspoints. Diesellok klass 218 469-5 typ RP GmbH, loket har digitaldekoder och ljudmodul, DCC, motor med svänghjul, drivning på 4 axlar, slirskydd, LED, separat monterade handräcken, längd över buffertar 102 mm, epok V.
Prototype: Railsystems RP GmbH (RP) class 218 general-purpose locomotive. Diesel hydraulic locomotive with roof version for the MTU 16V 4000 R40 motor. Exhaust hoods moved. In the current paint scheme ('Nose Art'). The locomotive is a tooling variation with a new roof version to represent the fourth production series. The locomotive has a built-in digital decoder and sound generator for operation with DCC, Selectrix, and Selectrix 2. The motor has a flywheel. 4 axles powered. Traction tires. The headlights and marker lights change over with the direction of travel. Warm white LED's are used for the lighting. The headlights, marker lights, and cab lights can be controlled digitally. The locomotive has a close coupler mechanism. It also has separately applied grab irons. All of the functions can also be controlled in the SX2 digital format. Length over the buffers 102 mm / 4'. Over the past 40 years, the 218 series has shaped the image of Deutsche Bahn away from the main electrified lines like no other diesel locomotive. Both in double traction in front of heavy InterCity trains in the Allgäu and on the Marschbahn line or used in regional transport services as push-pull trains the 218s clearly played a significant role in determining the image of traction with diesel locomotives. However, in recent years, their numbers have dwindled considerably. With a service life of around 40 years, many have been decommissioned and very few got a second chance after they were sold. One of the lucky ones was 218 469, which had to be taken out of service on 25 February 2016 at the DB factory in Kempten. 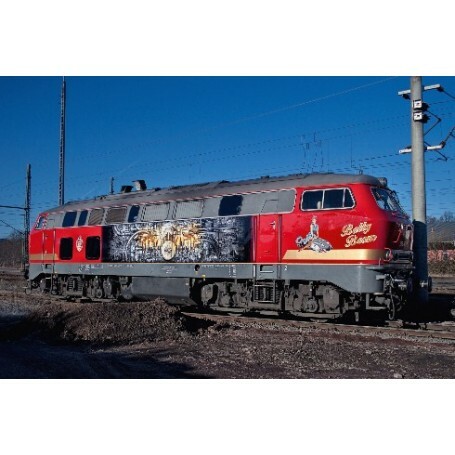 Railsystems RP GmbH in Gotha then purchased the locomotive, overhauled it and since then has also used it as a rental locomotive for spot transport. In the course of 2016, notable technical images were added to the red paint on the side walls as well as a golden bar laterally on the front. What captures particular attention, however, is the Pin-up Girl perched on a shark-like torpedo, on one side of the drivers cab. Known as Betty Boom, she is reminiscent of the decoration featured on bombers and fighter planes in World War II (nose art). The past of the 218 stretches back as far as the construction of the V 160 series delivery, when first consideration was given to replacing steam heating with electric train heating as part of the ongoing structural change. After trials with series V 162 (from 1968: 217) and V 169 (from 1968: 219), following the development of a 2500 HP diesel engine in 1968/69 by Krupp, twelve 218 series locomotives were delivered with this engine. With the 218 001-012, the special heating units could be omitted; the heating generator was hydraulically coupled with the traction diesel if necessary. Bogies, gears, brake systems and the cooling system had been adapted to the greater engine power and the expected higher speed. The twelve pre-production locomotives were followed between 1971 and 1979 by 398 production locomotives. In addition to Krupp, Krauss-Maffei and Rheinstahl-Henschel were also involved in their construction. Naturally, the series underwent many enhancements during this long procurement period. To begin with, exclusively the 2500 HP engine was built, but the later delivery series, and therefore more than half of the locomotives, were produced with a more powerful 2800 HP engine.